Now for this particular concert…Plain White T’s is amazing on stage. Their live vocals are very close to perfection, with every note being hit and every lyric being heard. I would have liked some signed merchandise for sale from them (like the other two bands). This is definitely a group that is great to see in concert, either on their own or other bands like this summer’s tour. For me, I have always liked their well-known tunes, but seeing them live made me a bigger fan and I found myself downloading more of their songs on iTunes later that night. Daughtry came next and the lead singer is a force to be reckoned with. Chris Daughtry’s voice, as I’m sure you know, is real rock/metal. He is the new Axl Rose and Sebastian Bach. Not that I am tired of hearing his band!! He seems to really take care of his instrument, which Axl can attest to as being super important. Sebastian Bach and Steven Tyler are right in Daughtry’s wheelhouse and I feel if he took some metal songs from the 80’s and 90’s I would love to listen to him more. Covers are not always the best way to go, but I really don’t care for a lot of his songs. His rock scream is awesome, but he is hard to understand. I feel like he didn’t make any fans that night. 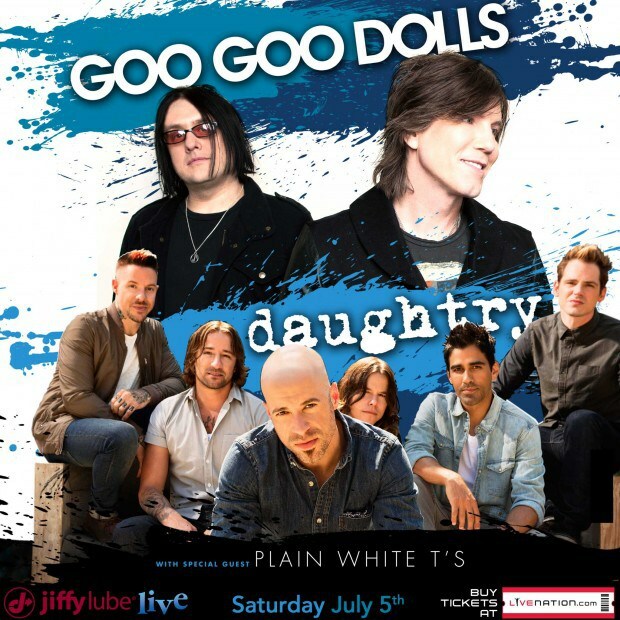 If you are already a Daughtry fan, you will stay one, but I would have been more entertained if they had covered some Steelheart. The Goo Goo Dolls had a big hoop to jump through for me. I have seen them before and this time I was curious if they would hold to the standard they set in their previous shows. They did; Johnny Rzeznik surpassed my highest expectations. I don’t know if it was the drugs that he was on (prescribed for pneumonia) or what, but his personality really came through this night. In concerts past he has been more sedate. If you look up interviews with him over the years, he is very charismatic, but in concert he has always maintained a coolness. That all changed with this performance. He was hilarious at times and of course, sang like a dream. Splitting leads with Robby Takac, who sang their original tunes due to Rzeznik’s shyness when the band first got together, the night was a real rock concert. I have seen them before and I’ll see them again! !